Tracking (Trailing) can be a fun and rewarding activity. 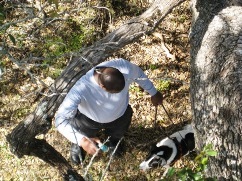 You and your dog can learn to track for Search & Rescue, or just for the fun and exercise it entails. You will learn how to lay a track, how to start teaching a dog to track, how to keep your dog on track, and how use tracking in urban versus rural areas. In this class, you will complete a half-mile track. 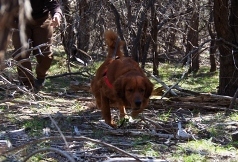 Dogs that do well in tracking have a high activity level, stamina, and are in excellent physical condition. Additionally, the dog must love to play ball. Brachycephalic breeds such as Bull Dogs, Boxers, etc., would typically not be suitable for the scent work or Tracking. Feel free to discuss your dog's capabilities with us if your are interested in this class. There must be 3 students to form a Tracking Class. The classes take place on our 100 acre property, as well as at some public wilderness areas. 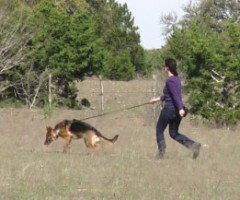 The basic Tracking Class is 2 weeks long and meets every weekday, Monday - Friday. Additional weeks of tracking can be arranged for more advanced techniques. The price for Tracking Class is $300.00 per week.